So you want people to visit and read your blog? Based on my ten-and-a-half years as a blogger, here are five surefire ways to get blog traffic. Be sure to write posts with titles like, 5 Surefire Ways to Get Blog Traffic. Create titles like people see on the covers of magazines. Everyone likes to think that any challenge in life can be overcome by a few steps. It's usually a lie, of course. Life, after all, is more complicated than that. But people like to think that it's not. Be sure to use bullet-points as your primary means of communication. People don't have much use for the consideration of unknown mysteries. So, even if you don't have any idea what you're talking about, use a bullet point and you'll seem like an expert. Tell people how they can monetize their blogs...and their lives. Show them how, by being market-driven, cultivating their brands, and following whatever the crowd says is important to them, they can make money. If you're going to talk about politics, make sure that your every phrase has a sharp elbow and will make your readers cheer with malice. Nothing makes the readers of many political blogs happier than having their own points of view confirmed in ways that are vicious and condescending toward the opposition. Never discuss the most important issues of life. Never talk about the fact that all human beings are in need of the forgiveness of sin and freedom from death. Never talk about how desperately God loves all people, so desperately that He became human in Jesus of Nazareth, bore the death punishment for sin we all deserve, and then rose from the dead in order to give forgiveness of sin and new, everlasting lives to all who repent and believe in Jesus. It makes people uncomfortable when bloggers do that. It makes them think that maybe they aren't masters of their own destinies, after all. I've violated these five methods throughout my blogging career and can proudly report that I average about 200 visits to my blog each day. According to Technorati, the blog is presently ranked 3838 worldwide and falling. Pretty impressive, huh? ...was Chris Tomlin's Born That We May Have Life, an almost immediately singable Christmas song that doesn't compromise substance for accessibility. It's from his 2009 release, Glory in the Highest. Written by Tomlin, Ed Cash, and Matt Maher, Born That We May Have Life a stirring yet simple statement of faith and awe. It's gotten my day off to a great start! I've mentioned it before, but I'll do it again: If you want to enrich your celebration of Christmas this year, get a copy of Glory in the Highest today. I have no affiliation with LifeWay, the book and music retailer, other than being a customer. But you can find Tomlin's gem, the best Christmas LP that I've heard in years, at LifeWay, either at one of their brick and mortar outlets or online for only five bucks. You blow five bucks all the time, it's likely. But this will be a well-spent Lincoln! Fantastic pictures, accompanied by a short essay on the immediate aftermath of the December 7, 1941 attack by the forces of Imperial Japan on US military installations at Pearl Harbor, can be found here on life.time.com. Worth the short time required to read the essay and go through the slide show composed of many pictures that never were used in Life magazine, the eminent pictorial chronicler of the world before television became the force it became (used to be) and long before the Internet. 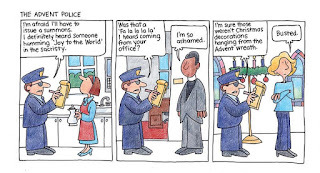 Don't Be Afraid of the Advent Police! Loved this cartoon, which I saw on Facebook today. 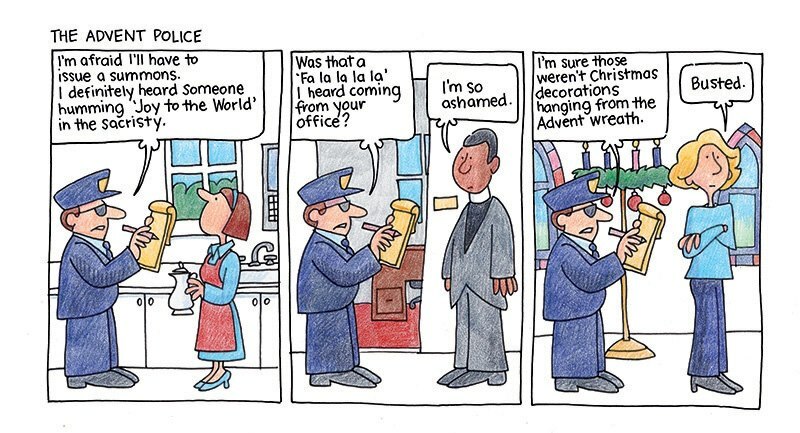 My seminary training that told me that you sang no Christmas hymns and had no Christmas decorations in the church building during Advent got upended during my first Advent as a pastor. A parishioner said to me after the Second Sunday of Advent, "Pastor, I notice that we haven't sung any Christmas hymns yet." Drawing on my "theological training," I told him (as if he didn't know): "This is Advent. Advent is a time of preparation for the coming of Christmas." "But, Pastor," he said, "singing Christmas hymns is how I prepare for Christmas." I knew that the same was true for me. I prepared myself for Christmas during Advent with all that reminded me of Christmas. I always started playing Christmas music on Thanksgiving and played it loudly throughout my house until the end of the year. At the moment that parishioner said this to me, my family and I had had our Christmas decorations up for about three weeks. I never want to get rid of Advent hymns or the celebration of the unique elements of Advent. But during Advent, we do prepare for the coming of the celebration of the birth of Christ (as well as of the certainty of His return in glory one day) and it's good to be reminded of this fact. So, I've been sure to include Christmas hymns during Advent worship in the churches I've served ever since. By the way, it's by this same logic that I also reject the ancient custom of putting "Hallelujah" away during Lent, as we were also taught to do in seminary. Jesus is still risen from the dead, whether it's the Third Sunday in Lent or not. Stifling our Hallelujahs during Lent, pretending that we don't have an Easter victory for which to praise God during that time reminds me of an old bit used by comedian Steve Martin. Martin would be in the middle of his routine, look down at his feet and say, "Oh, my shoes are untied," bend down and then pop right up again, saying, "No, they're not. I love to fool myself like that!" We can remember with awe, sadness, and contrition Christ's death for us on the cross. But we can no longer pretend that His lifeless body lay in the tomb. We can't fool ourselves because He is risen! And so, as Christians we have just as much reason to shout, "Hallelujah!" ("God be praised!) during Lent as at any other time of the year. Why should we stop praising God because of what is, when wrongly used, a human conceit. In fact, there's even more reason to sing Easter hymns during Lent than there is for us to sing Christmas hymns during Advent. Every Sunday is meant to be a "little Easter" in which we celebrate Christ's victory over sin and death when He rose from the dead on the first Easter. That's why the Sundays that fall during Lent aren't counted as part of the forty days of the season, meaning that we call Lenten Sundays, Sundays in Lent, and not Sundays of Lent. The Church Year is a tool that can be used to glorify God and convey the central truths of the Christian faith both to seekers of God and to those who have been in relationship with God through Jesus Christ their entire lives. It can help us to worship God and live out a balanced faith rooted in the whole truth about the God revealed to all the world in Jesus Christ. But the Church Year falls into the category Martin Luther called "adiaphora," a Latin term that means, "indifferent things," things that, in themselves cannot bring salvation. It is, as the theologians say, "non-salvific," incapable in itself of bringing a saving faith in Jesus Christ to those who use it. The Church Year then, is the moral equivalent of a hammer. A hammer is a great tool, but it can't save you from sin and death. Only the word of the Gospel of Jesus Christ and that word embodied in the sacraments of Holy Baptism and Holy Communion can work salvation and the forgiveness of sins. You won't go to hell if you sing a Christmas hymn during Advent. Nor will God be upset if you continue to sing hymns of praise during both seasons, also no-no's according to liturgical propriety. Christ sets free all who hear His Word and by faith, turn from sin and believe in Him. We are no longer slaves to the proscribed customs of human beings. We may find the Church Year a useful tool for growing in our faith. But we shouldn't be slaves to it. In it, my wife and I were the ages we are today. But we were back to taking preaching calls to congregations with pastoral vacancies or where the pastors were on vacation, just like we did when I was in seminary thirty years ago. We arrived at a church building that looked more like an old-fashioned township hall than a traditional church building. The exterior was covered with simple white clapboard and it was topped by a simple, shingled roof like you'd see on a slab house. We walked inside to see that the interior was one room, except for a few restrooms tucked away in a corner. The walls and ceiling were untreated, unpainted wood, the beams overheard, exposed framing wood. There were no pulpit, altar, lectern, nor a single other item that looked "churchy." That was OK, my wife and I told each other. Over the years, we've worshiped in school gyms, a Lions hall, a movie theater, and a cafeteria. In other words, church buildings don't have to look like church buildings we're used to and worship services don't have to be like the ones we're accustomed to, as long as the Gospel is taught in its purity and the sacraments (Holy Baptism and Holy Communion) are administered rightly. I didn't remember all the lines of Article VII in my dream, mind you. I just smiled as I scanned this "unchurchy" place and thought, "Article VII." But then, we met the people. The average age was about 85, although it was clear that quite a few of the folks were in the habit of dyeing their hair (even their eyebrows) all sorts of natural, that is, unnatural, colors. From the beginning, they were a talkative bunch. They talked through the Order for Confession and Forgiveness, through hymns, through the Bible readings, and, in fact, at every single point in the service. And they weren't just talky, they were disruptive. They were all seated in chairs and none of them seemed to give a second thought to sliding the chairs across the hard floors to get up, creating sonic skidding sounds, in order to talk to a neighbor seated elsewhere. Suddenly, I found myself preaching on an Old Testament text and was constantly having my own concentration disrupted by the mayhem. I'd be a in the middle of a point and the whole group would get up for restroom and smoke breaks. My wife and I kept looking at each other in mystification. It's probably no stretch to say that many, if not most, Christian congregations are composed of functional atheists for whom the Church is basically a social gathering which occasionally does nice things for people. But this group was overtly heedless, almost scornful, of God, Christ, the Bible, worship, and so on. At one point, they'd settled back in to listen to the sermon and I determined to keep it short because of the short attention span of the congregation. Just then, a man with Grecian Formula brown hair and mustache, pushed himself from his chair in the back of the sanctuary to station himself behind a person sitting toward the front. In the meantime, one woman was speaking loudly to another woman, also toward the front. I did something I've never done as a pastor: I gave the loud talker the evil eye. She shut up, but then the Grecian Formula guy started conversing with the guy in front of him. I tried the evil eye on him. He simply looked at me dismissively, contemptuously, and started talking even more loudly than before. The next thing I knew, the whole group had run (yes, the 85-year-olds ran) to a back room I hadn't noticed before and emerged with bicycle helmets in hand. As I struggled to keep preaching, each hung their helmets on hooks on the bare wooden wall and stood back about five feet. Then, in unison, they started a deafening countdown: "10, 9, 8..." At "Zero!," they all grabbed their helmets and were out of the room. My wife and I were the only ones left in the little building. "I think we're through here," I told her. We both laughed and walked away, the bicycling octogenarians nowhere to be seen. Keep in mind, this was just a dream. But its point was clear: This strange church wasn't a church, not because it didn't look like a church, but because its people ignored the Gospel and presumably disdained the sacraments. The people didn't believe. How many churches might that describe? This made me smile. The Biblical story of Jacob and Esau struggling in the womb apparently isn't as far-fetched as some people might think. Twins really do struggle in the womb. This will not come as a surprise to the mothers of twins. Here are some good thoughts on bullying from Mart DeHaan, leader of RBC Ministries. They were triggered by his screening of the 2011 documentary, Bully. ...aggressive behavior that uses force or coercion to humiliate and exploit the weakness of others. He then points out that this phenomenon isn't confined to children and cites examples of bullying, as well as bravery in the face of bullying, from the Bible. I have a particular interest in bullying because I myself was bullied throughout much of my growing-up years. Junior high school (grades 7, 8, and 9) was a nightmare for me. Grade 10 was only marginally better. It included being frequently hit (hard) on the back of the head, getting punched, and often facing off against three to four taunting, hitting, pushing bullies on the daily walk home from school. Verbal taunting and putdowns were steady. Because of these and other experiences, nobody has to convince me of the reality of original sin. We come fully equipped with the desire to "be like God," which we interpret as being domineering top dogs or at least keeping others "beneath" us. Adolescence is a time of sorting out and I know now that those classmates who bullied me--many among the most popular kids in the school--were sorting things out: their places in the world, their identities, and so on. I just happened to be a convenient tool for doing that. In my own case, the experience has left me with a permanent preference for the underdog. I try my best always to affirm the person who seems most ignored or even the most despised in any circle of people. Nearly five decades later, I can look back and say that while I didn't deserve to be verbally derided, physically punched, slapped in the head, or shunned, my very appearance in a room acted as a flashing, "Bully me!" sign. I was mouthy and egotistical, risky behaviors for one of the smallest and youngest people in my classes. These behaviors can partly be explained because I wasn't just younger than my classmates, I was also the least mature. I was no athlete, though I have always loved sports. I wasn't a scholar or a musician. I had no niche and I was coddled at home. There was plenty about me not to like. I'm fortunate. I eventually found something of a niche in high school. In subsequent years, my wife Ann has taught me how to do what I so desperately wanted to do in my growing-up years, make friends. God is engaged in a lifelong project of making war on my ego, which, I hope, makes me a little easier to be around. He's also constantly assuring me of my value and worth through Jesus Christ. Bullying, it seems, is an even bigger issue today than it was when I spent chunks of my school years dreading the beginning of each new day. We live in a far more violent society today. So-called reality shows seem to convey that wise people dominate others. Thuggery is extolled. Dysfunctional families create holes in the souls of too many children. Social media make it easy to bully and humiliate others over the Internet, complete with photoshopped imagery that gives credence to the cruel things bullies say about others. Many kids, whether implicitly or explicitly, see all of these things as green lights for bullying. They make it a hard time to grow up! Which is why the ministry of the Church is so important! We proclaim a God Who became one of us in order to offer new life to all who believe in Him. You don't have to be the strongest, smartest, or best-looking according to the shifting standards of a social system ticketed for hell. God loves you as you are and wants to help you become all you were made to be. If we adult Christians can, through our words and, more importantly, our actions, convey these truths to young people, they'll be less inclined to be bullies or to accept the bullies' verdict about their lives. They'll have less reason to lash out at others because of being the victims of bullying. As with all things in life, sharing and absorbing the truth about the God Who meets us in Jesus Christ into every element of our lives will go a long way toward diminishing and erasing bullying from kids' lives. We'll never completely eliminate evil from this fallen world or from ourselves. (And bullying is evil.) But I've found that when Christians start living out their faith in Jesus Christ and relying on the Holy Spirit to guide them in living as the people we were made to be, good things happen in the world around us. 3 Joyful Stories About Fighting Hunger! Stay Awake: Christ is Coming Back Again! Today is the first Sunday of the first season of the Church Year, Advent. When Christ comes back, He will finally and fully establish His kingdom with those of us who have, as the Bible says, “longed for His appearing” and have endured in faith in Him alone. From the early Church, we’ve inherited a simple confession of our faith: “Christ has died. Christ has risen. Christ will come again.” Advent reminds us of these truths. But when will Christ return? Under what circumstances? And what does it all have to do with you and me? We read these words and, being clever, we figure that the end of this world and the return of Jesus must be close at hand. And that’s true. Jesus is saying that all of the drama, earthquakes, tsunamis, wars, and terrors of nations that He said must precede His return would all take place within the lifetimes of the first people to whom He spoke these words in the first-century AD. Peter wrote to Christians dealing with these doubts and questions in 2 Peter 3:9, where he says: “The Lord is not slack concerning His promise, as some count slackness, but is longsuffering toward us, not willing that any should perish but that all should come to repentance.” “You Christians overcome by the hardships you undeniably endure in this life,” Peter was saying, “get over yourselves!” Today, on the authority of God’s Word, given through Peter, I can tell you that Christ hasn’t come back to this world yet because He loves those who don’t know Him and need Him. These people need time to hear the Gospel, the good news of new and everlasting life through Christ. They need time to turn from sin, time to embrace the gift of faith in Christ. And here’s the key takeaway for you and me as Christians this morning: Christ has also delayed coming back in order to give you and me the time we need to share with our neighbors and world the message about Christ and the salvation that comes from Christ alone. By sharing Jesus with them. By inviting them to join us for worship or Sunday School or Bible study. By showing mercy and forgiveness to people who have hurt us. By listening to the hurts of others and offering to pray with and for them. By serving them in the Name of Jesus. By giving food to the hungry. By helping to spread the good news of Jesus throughout the world. That’s why Jesus tells us in verse 34 “to take heed” of ourselves, to stay awake, to stay alert. He tells us this not only so that we can resist temptations that could leave us trapped in sin and death when Christ returns or when we see Him face to face as the judge over our lives. Jesus also tells us to stay awake and alert so that, no matter what’s going on in our lives or in the world, we keep pursuing the commission He has given to us of making disciples of our unbelieving or spiritually-disconnected neighbors. There he found himself, inexplicably, being drawn to interact with a woman forty years his senior. She took this young man under her wing, put up with his immaturity and flippancy and self-regard, and taught him Who Jesus is and what it means to follow Him as your only God, King, and Savior. That young man is not so young any more. And he’s still an imperfect sinner in daily need of the forgiveness and new life that comes to those who entrust themselves to Jesus Christ. Who will you share Christ with this week? The clock is ticking. We don’t know when Christ will return. We don't know how much time each of us personally has on this earth. But we do know that, as surely He came upon a midnight clear, an unobtrusive baby who would grow to die for our sins and rise to give us life with God, Jesus will return. This time, there will be nothing silent about His coming. There will be nothing quiet about His judging “the living and the dead,” not on the basis of their works, or church membership, or popularity, or wealthy, or power, but solely on the basis of whether we have trusted Him with our lives and let Him cover everything that is sinful and dying about us with His forgiveness and grace. Jesus will come in glory and time will have run out. There will be no more chance for anyone to repent and believe in Him. Make it your daily aim to share Christ in some way with those who, absent your witness, absent your love and encouragement, absent your good word from God, will otherwise stand naked in their sins when they meet Jesus, uncovered by His grace and forgiveness, facing a Christ-less eternity.